The York Region Science and Technology Fair is a regional Science Fair that showcases student research from students in grades 7 to 12. 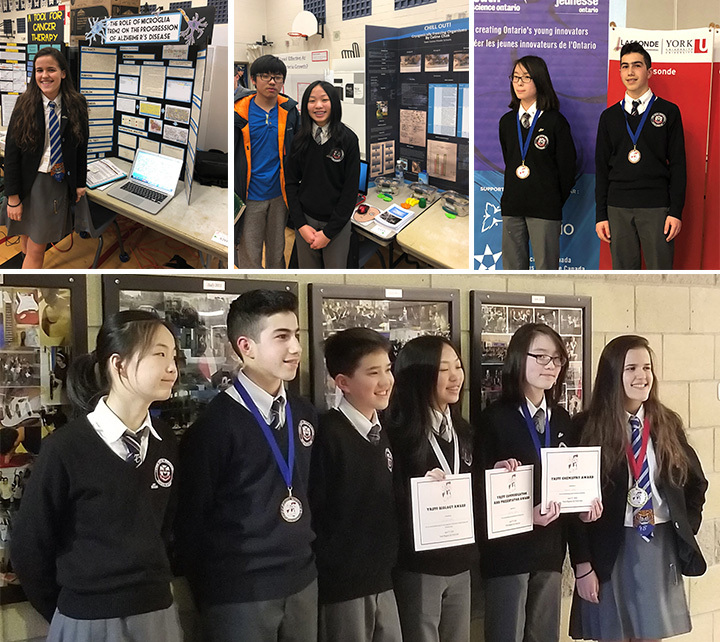 On April 7th, the top 5 grade 8 winners of TCPS STEM Fair and one of our grade 12 students participated in this year’s Fair where 133 projects were presented. Congratulations to Anabela C. (grade 12) who received a Gold Medal with her project “Mathematical Modelling of Neuroscientific Correlations of Proteins on Brain Synapses”. Anabela has also been awarded the York University Travel Recipient Award for advancing to the Canada Wide Science Fair. This award will cover all of Anabela’s expenses related to her participation in the Canada Wide Science Fair in Ottawa this May. Well done! At the Elementary level, congratulations to Celine C. (grade 8) who was awarded the Biology Prize winner for scoring first place in the Biology category, the Communication and Presentation Award, a Silver Medal and a $100 Cash Award with her project “Chill Out: Cryogenically Freezing Organisms”. Congratulations to Emily S. (grade 8) for winning the Chemistry Prize for scoring first place in the Chemistry category, a Bronze Medal and a $50 Cash Award for her project “Biodegradation of Plastics”. Congratulation to Marco L. (grade 8) who was awarded a Bronze Medal with his project “Flex of a Hockey Stick and Accuracy of a Shot”. Outstanding results for the students at Town Centre Private Schools!